Home › News › Serena Williams outburst: What does it have to do with being Black? So, Serena Williams looses it with an umpire, and instead of commenting on the behaviour itself many posts on forums and comments on articles start talking about race. From 'She did not get the appropriate sanction because she is Black' to 'Her poor behaviour is because she is Black'. I am sure some people with nothing better to do post these comments just to provoke a reaction, but for others it is what they really believe. One post (which I reported) read: "So ban her, ban lewis H ban tiger W, ban her sister, ban Usain B i could go on and on you still cant take away what they all have...extra melanin (sic)". Serena may have been right to be annoyed - it was a key point in the game. Instead of giving the point away the umpire could have called for it to be replayed. On the other hand, why did Serena feel the need to shout when her opponent was about to hit the ball? Could that be classed as cheating? Either way, her comments to the umpire became personal and I do not agree with that. I have absolutely no idea why anyone who watches tennis would think her bad behaviour has anything to do with her ethnicity. With just a little thought this hypothesis would be proved irrational. John McEnroe was famous for losing his temper, Andy Murray has done it. Both could have at times been given stronger penalties for racket abuse, but weren't, for reasons known to the decision makers, but I am sure it was not to do with race. They did not behave badly because they were White, or because they were not Black. They just behaved badly. 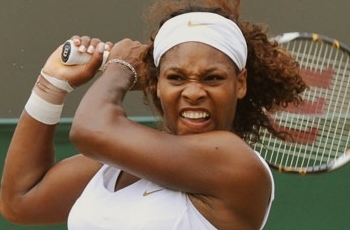 Should Serena feel like she is playing tennis for all Black people? Should she be a good ambassador for Black people as well as a good ambassador for tennis, and a good ambassador for women 24 hours a day? I do not excuse her behaviour, but no one is perfect, no matter their heritage or skin colour. It continues to seem as though people of Black and minority ethnic (BME) backgrounds have to behave in an exemplary manner at all times in order to try to achieve, let alone maintain, a good image, not just for themselves, but for all BME people. It sometimes feels like many of the things we have done right go unnoticed and are certainly not attributed to our ethnicity, but the second we do one thing wrong it is because we are Black. It reminds me of a brief stint in a Government department when I was asked questions about things like poor achievement of Black boys at school as if I was speaking for the whole of 'my race'. As I entered a sector where the BME community was not well represented, I found added pressure to represent well on behalf of all Black people past and present, by people who said things like I first saw a Black person in the dark when I was in my teens and was scared. It was tough. I knew that if I messed up it would be attributed to my skin colour, and I would be putting additional stumbling blocks in the way of any other Black person who came after me. It was a pressure I was not then prepared for, but I have since encountered time and time again. We often can't even afford to do what others do, we have to be better because even if five people get caught breaking a rule that had not been enforced for years, if one is Black then it is likely to reinforce someone's negative stereotypes, and that one may find him/herself being treated more harshly because of their ethnicity. This double standard was evident to me during the riots. Someone I know went to work and was told "these rioters are letting down your race bruv". Were all the rioters Black? No, not by a long shot! Were a disproportionately high number of the people I watched being trawled all over the BBC on one particular day to give their opinions on the state of the communities and the cause of the riots Black? Yes. Why? Because White people do not work in the community? Because they were busy? Or because it suits the media to reinforce the stereotypes prevalent in our society - Black people are trouble. It was also evident in Facebook posts too - 'Why are Black people always rioting', 'don't Black people know how to behave'... and so on. It seems that when some people do something negative and some of them are Black, all of them are Black. Will it ever change? Even if you become one of the world's greatest tennis players - will it ever change? I have more questions than answers on the subject and think that the discussion could be more valuable than a definitive answer. Submitted by Debra Viller (not verified) on Sun, 18/09/2011 - 17:39. Well written, I totally agree even though I did not see the incident. Black people, it seems do have to work twice as hard to achieve and on top of that they need to be squeaky clean. The dilemma sometimes for Black people is that we don't share our success enough in places where we a re totally viable. There are plenty of positive achieving role models, business people and entrepreneurs but we don't know about them unless you know. Those who do no don't share with the fear of somebody 'steeling my idea', we need to really help and support each other in order to make a change. Serena's incident and then the repercussions, just re-enforces that even though we think on some level that things have change a lot has stayed the same. Those of us, in a position to make change need to be the change agents to facilitate change and not judge those who are trying to make a difference.